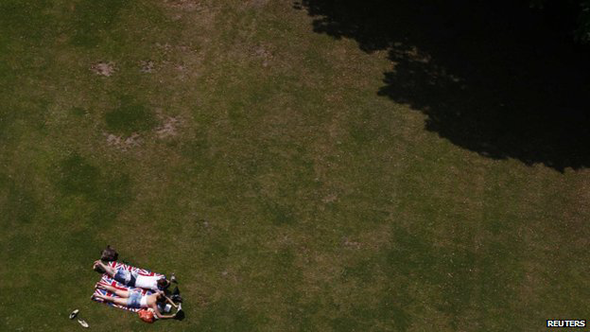 Soaring temperatures in the UK have been welcome for some. But how can people keep comfortable when the mercury rises? There are a number of simple solutions which might not always be obvious. "The most obvious suggestion to me is that you dampen your clothes," says Cambridge University physicist Lisa Jardine-Wright. In order for the water to evaporate - changing its state from a liquid to a gas - there needs an input of heat energy, she explains. This energy will come from the heat of your body which produces a cooling effect to your skin, lowering your temperature. If you use a fan as well, the air blowing over your skin speeds up the process of evaporation, helping you to feel even cooler. "When I was cycling in France it was more than 40C and I soaked my T-shirt in water before I went out. But that's a bit extreme," Jardine-Wright adds. "Anything that involves evaporation is going to take the heat away from you." Plunging your hands into a bucket or a basin full of cold water will help you cool down, says Mike Tipton, professor of human physiology at the University of Portsmouth. When your deep body temperature rises, blood is sent to the surface of the skin. "Your hands have a high surface area - it's like you have five radiators sticking out of your palm," says Tipton. "As soon as the deep body temperature returns to normal, it slows the blood flow to your hands and you'll feel cool." 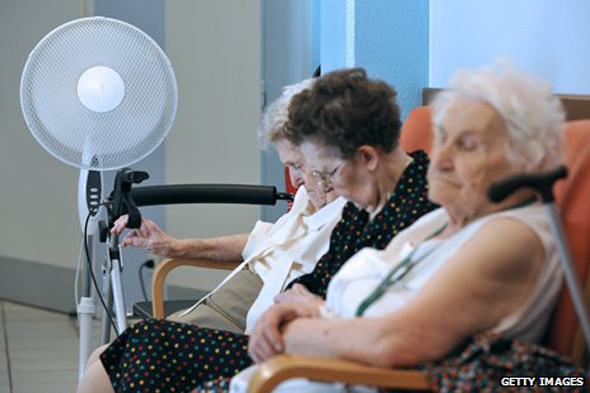 A fan placed in the middle of a closed room will circulate the air, which helps speed up the evaporation of your sweat. But it will be much more effective if the device is placed next to an open window, says Jardine-Wright, as this will draw air from outdoors, which should be colder. "You're taking the cooler air from the outside and propelling it inside," she says. "If there are no windows or doors open you're just circulating the hot air." 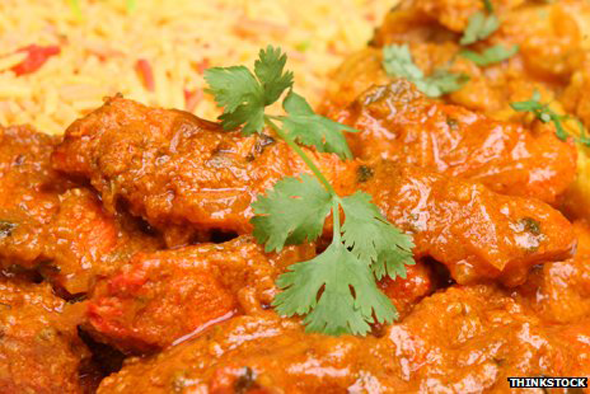 Tucking into a hot vindaloo or madras may seem a counter-intuitive way to lower your temperature. But eating spicy food helps cool you down, says Tipton. Curry contains capsaicin, a heat compound in chilli peppers that stimulates sweat production. "Anything you can do to make sure you are sweating means you will enhance evaporative heat loss," Tipton adds. "As the water evaporates you will feel cooler." It's widely assumed that wearing lighter-coloured clothing is the best way to stay cool. This isn't necessarily the case, however. A 1980 study of Bedouin tribes found the colour of their garment made little difference to their body temperature. "White clothing will reflect more light, but black clothes are better radiators of heat," says Jardine-Wright. However, she says there is a option that has very clear benefit - wearing looser clothes, like the robes favoured by the Bedouin. "If you have air circulating next to your skin, it will help to evaporate the perspiration, and this will make you feel cooler." 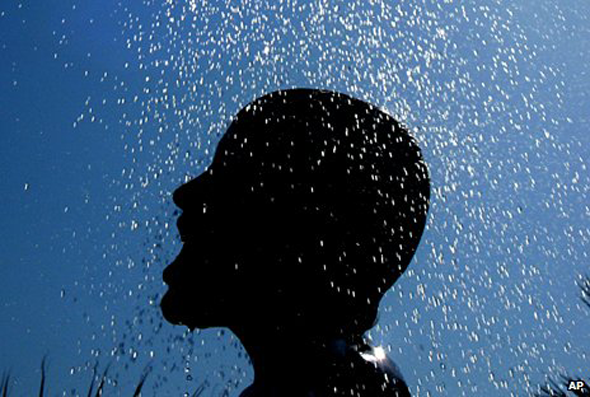 Standing under a freezing shower might sound like the quickest way to bring your temperature down. But your body will react to a dramatic change like this by trying to preserve heat. "If I'm hot and I go under a cold shower, I'll shut down the blood flow to the skin and trap the heat inside me rather than let it escape," says Tipton. As a result, he says, it's better to use water that is in the 20s Celsius than water that is in the 10s. "It's better to have a warmer shower that is cool enough to lower the deep body temperature but is warm enough to allow the blood to the surface of the skin." People with sash windows don't always remember this, but opening both the top and bottom windows by equal amounts is a very efficient way of cooling down a room. This lets rising warm air out of the top while drawing cooler air through the bottom. The same principle applies in two-storey homes, says Jardine-Wright. "It's good if you can get the circulation going throughout the house," she adds. "If you open both the upstairs and downstairs windows, you will improve the circulation through the house as the hot air rises and cold air enters through the ground floor windows." 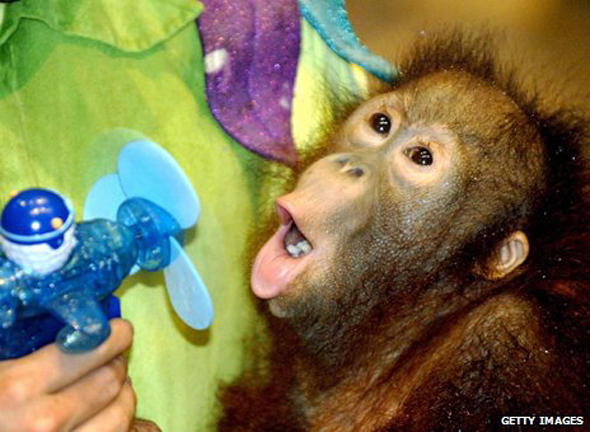 If you use a fan, make sure you direct the flow of air to your face, says Tipton. "It's more effective because the face has so many receptors on it," he says. "Even though you're not cooling down your whole body, fanning your face has a disproportionate effect on your comfort." However, he warns, it's important not to make a common mistake - using a manual fan too vigorously, and warming yourself up by doing so.